In June 2017, during the E3 week, Brawl Stars shot into soft launch like no other game before. Supercell’s latest masterpiece to survive the company’s infamous gauntlet of development was revealed to millions of players around the world via YouTube Live tournament. The game looked and sounded simple and fun. Nintendo-esque, if you will. Just like the company’s last three super mega hits: Clash of Clans, Boom Beach and Clash Royale. But that was in June 2017, almost a year ago. Since then Brawl Stars has been overhauled three times. Not to mention that the market looks absolutely different with battle royale games claiming all the glory and Supercell’s crown jewel, Clash Royale, clawing to hold its spot in the top 10. So, after pretty much re-doing the game twice after the soft launch, does Brawl Stars have what it takes to become as Supercell-style hit game? Or will it join Spooky Pop (Supercell's Spooky Pop and the Six Rules of a Hit Puzzle Game) and Battle Buddies (Battle Buddies - Four Mistakes Away From Greatness) as one of those fun and polished games cut by Supercell during the soft launch? Each of the three overhauls of the game can be seen as massive spikes in the revenue after which Brawl Stars has declined rapidly. Simply put, Brawl Stars can't hold its position in the grossing ranks in current form. Riot’s League of Legends (LoL) is the Mount Everest for (most) of us game makers. It’s a relatively simple looking game that carries unlimited depth. It’s a gamers’ game – not easy to get into and impossible to master. It’s also a game makers’ game, offering a very ‘fair’ character and skin driven monetization model that doesn’t allow payers to get any added benefit while still generating close to two billion (!) annually. And it’s also a true eSports game, driven by a behemoth player base of 30M daily active players and a couple of hundreds of millions of fans. While MOBA (Multiplayer Online Battle Arena)category is much like all of other games categories, where the winner takes it all, the fact that few of the rivals to LoL started getting a good amount of traction has kept the category somewhat competitive. Valve’s DOTA2 survived as the League’s alternative, largely because it is actually an even more complex and even less monetizing version and because it is published by the company that owns the marketplace (Steam) it is offered in. And my personal favorite, Blizzard’s Heroes of the Storm, came out with (what I consider) a fun alternative for the ‘less devoted’ MOBA players. And yes, Blizzard also owns the distribution channel (Battle.net). The ungodly success of League of Legends coupled with the eSports hype train has enabled teams around the world to get their dream games greenlit and companies to get funded with a goal of creating a “mobile version of League of Legends”. Yet one after another these games failed. Several MOBAs have made valiant attempt to become the League of Legends on mobile, but none of them had meaningful success in the Western market. 1. The gameplay was identical to League of Legends with a fraction of content and limited session length. A proposition that is not very enticing to MOBA players. Certainly not enough to lure them away from their computers and the resulting gameplay wasn’t nor a gameplay approachable enough for players new to the genre either. Vainglory is an excellent example of a game that mimicked League of Legends on mobile offering largely the same gameplay but just a fraction of the content. Ultimately, the combination of limited content and inaccessibility in conjunction with rising competition and user acquisition costs proved to be too much. 2. The game offered a ‘twist’ to the gameplay making it simpler than League – a Diet Coke version, if you will. The problem was these games were too simple of an experience for MOBA players and still too unintuitive for players new to the genre. They also tended to face balancing issues due to the fact that they attempted to break the rule. Fates Forever offered a more simplified version of League of Legends to players on tablets. The game suffered from its lack of content and depth. After a long soft launch and lackluster launch, the developers were smart to back out and work on something that makes sense - which in their case was Discord. But there have been two mobile MOBAs that were successful as well. Both Arena of Valor (Arena of Valor - the Biggest Hit You've Never Played) and Mobile Legends are having success (which is a mild way to describe Arena of Valor, one of the biggest mobile games ever) in Asia. Both of these games offer almost the same amount of gameplay depth and content as League of Legends with very limited twists to the core gameplay. All the innovation has been focused on simplifying controls for mobile and streamlining the gameplay. The reason why we are talking about MOBAs is that Brawl Stars was a new type of a take on the MOBA in a form of a simplified three-on-three shoot-em-up battle. Each player controlled a single brawler, which had a unique basic and ultimate attacks. In addition, brawlers differed from each other based on the number of hit points they had and the speed they regenerated their ammo. The objective of the game varied based on short time events known as ‘brawls’, which players participated in. The way I see it, Brawl Stars merged together two different sub-categories of games. On one-hand in looks and plays somewhat like a MOBA where two teams of class-based champions fight each other on a symmetrical map. On the other hand, the game borrows elements from action titles, focusing much more on the accuracy of the shot and allowing players to progress through a power curve outside the matches. Simply put, Brawl Star emerged as genre-defining game positioning itself between MOBAs and twitch-control shooters. 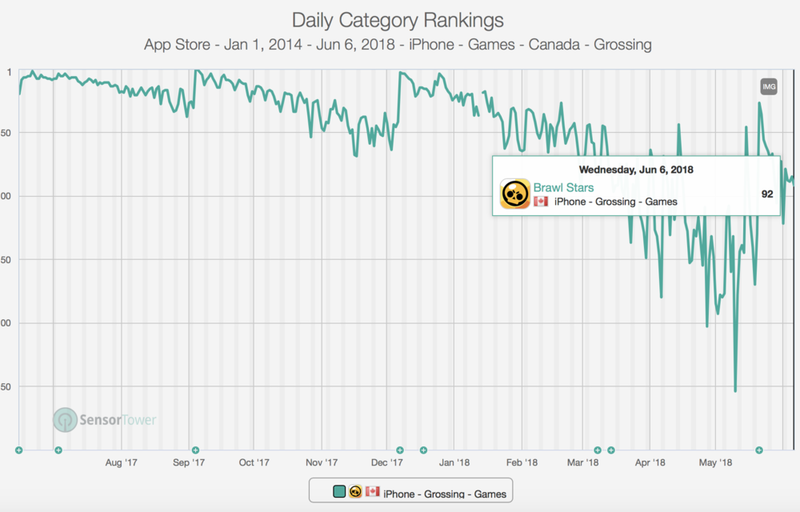 Brawl Stars blew up instantly as players around the world flocked to the Canadian App Store to download the game. It racked up 600 thousand installs on iOS alone during the first month (only in Canada!). This was due to the fact that Brawl Stars felt fresh – and was HEAVILY promoted through Supercell's Delta Force of influencors (check out the launch tournament below). It took the concept of a MOBA and threw all the complexity and nonsense away and replaced it with good-old arcade like shoot-em-up coupled with fun level designs and destructible environment. A top-down mobile Overwatch, if you will. Player took part in brawls to earn Coins, with each brawl lasting somewhere between two to four minutes. The amount of Coins player could earn were capped daily per brawl type, although new brawls opened up as the day progressed. This approach was similar to Clash Royale as it set a limit on the speed of progress without capping the amount or length of gameplay sessions. Playing brawls allowed players to earn or lose brawler specific trophies. Trophies allowed players to level up a brawler. When earned 100 Coins they could open a chest to receive a random reward of either a brawler or Elixir, which was used to level up brawler’s health as well as basic and ultimate attacks. Earning a duplicate brawler gave the player a Chip. Chips were used to purchase the Brawler of player’s choice, with prices ranging from 10 to 600 chips. As the launch video and the charts above suggest, the game received a Supercell-worthy welcome by both the gaming community and the developers alike. But as the first impression started to fade away cracks in the game’s design began to surface. 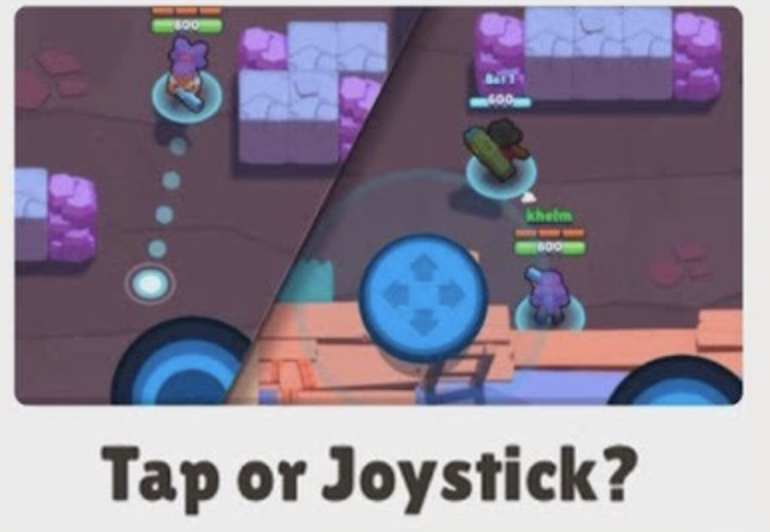 The two control systems were AB tested during beta and neither of them showed to be better than the other based on key metrics (source: GDC talk by Supercell's Touko Tahkokallio). Nevertheless, it was evident that players who started with the control scheme A ended up switching to control system B. In other words, the majority of the players ended up playing with their thumbs. One thumb to move the player and the other thumb to shoot by either tapping or holding and releasing. The problem in the two-thumb control systems was that Brawl Stars could be played in portrait mode only. This resulted in the control mechanics being sub-par, especially in levels where players attempted to attack targets beneath of them on the screen as all action and important information was covered with players’ fingers. Poor controls alone are something that will prevent a competitive game from being a success among the players. But Brawl Stars was hindered also by a (2) poor progression system. With 15 launch characters, the gacha was just too shallow. Duplicates felt meaningless. Brawl Stars gacha gave players two types of items: Chips, similar to Dust in Hearthstone and Elixir, the leveling currency used to improve brawlers’ stats. However, since there was only roughly a dozen brawlers, the cost to purchase any character directly with Chips increased exponentially while the Elixir system was too weak for players to get excited. The lack of content was enforced by the (3.) lack of gameplay depth. Sure, it was fun to blast away, and the levels had excellent rubber-banding mechanics that allowed the matches to remain exiting till the final ring of the bell. But eventually, the simplicity of the Brawlers combined with lack of motivation to play different Brawlers resulted in repetitiveness. Then there was (4.) the theme. While Western may sound fun, the theme truly lacks depth when compared to fantasy, sci-fi or military. Instead of being empowered by the theme, creating new brawlers was likely hindered by it. I feel like there is a hard limit of Cowboy, Indians Sheriff and maid iterations a team can come up with. Objectively speaking, Brawl Stars' quality is nowhere near the competition of today. Character driven games like Paladin Strike (top right), Arena of Valor (bottom left) and Vainglory (bottom right) are simply better. Comparing Brawl Stars to these games is like comparing Fiat to Mercedes, Audi and BMW. And finally, there’s the (5.) overall art style and the quality of art. Supercell is known for its very accessible art style that turns easily into animations and most importantly, reads well on a small screen. While Brawl Stars does read well, the overall art style feels childish, cheap and inconsistent between the brawlers’ portraits and the animated 3D brawlers. Personally, I feel the lack of quality 3D renders of the characters is playing against the intended brawler collection. The soft-launch was supported by an overwhelming stream of Brawl Stars streams from Clash Royale, Boom Beach and Clash of Clans streamers. In addition, a very active Reddit community was born - which ended up actually hurting the game instead of supporting it. While Supercell was redoing the meta twice, players were constantly demanding more Brawlers, more modes, more maps and were getting incredibly frustrated when the team was doing new features instead of content. Yet after a couple of months and a couple of updates, it was clear that the game as it was didn’t have the legs to become the genre-defining hit like Clash Royale, Clash of Clans and Hay Day were. Instead of giving up on an excellent idea, the team at Supercell went to work to course correct. The biggest issue in the launch version was the gacha. 1) It lacked content, 2) made poor use of duplicates and 3) was paced in a highly stingy way. Perhaps (1.) the biggest change in the update was the content of the gacha. In the new gacha player received upgrades, known as Pins, Badges, and Medals, directly from Brawl Boxes. Nevertheless, the player still had the chance to pick abilities they wanted to upgrade with Upgrade Tokens, which replaced the dreaded Elixir. Most importantly though, the punishing duplicate brawlers were gone. Which meant no more Chips to unlock the missing brawlers. That is to say, you could only ever be given a distinct pin once, so theoretically you could eventually collect them all. In addition to the new brawler upgrades, (2.) every brawler was given a unique Star Power, which unlocked once the player had his brawler fully leveled up. This Star Power, which in fact still exists in the current version of the game, was designed to draw players to fully level up their characters and also to offer perhaps a bit different way to play with their fully leveled up brawler. This was likely done to address the game feeling repetitive and lacking depth. Each star power was specifically designed to add additional mechanics to the game. The update also introduced a new game mode in the form of (3.) special events. These special events, which carried over to the current version of the game, open only once a week and require a Ticket to enter. Tickets can be gained through the gacha our bought directly from the store. The special event is likely designed to activate players during the days when the engagement in the game dips – such as during the weekends. By offering something unique during the weekends, Brawl Stars is able to draw their players back to the game on the days when they’re not following their weekday routines. Finally, all the metagame changes led also to a (4.) fully redone user interface including brawl screen, game rooms, and in-game shop. These UI changes made the game feel different and significantly improved the setting up of friendly matches. And yes, Supercell delivered on the (5.) Game Room improvements allowing players to enter friendly battles more easily and thus organize tournaments. 10 months after the world’s biggest soft launch, Brawl Stars was back with vengeance. The team pulled out the big guns and went after the two persisting issues: controls and progression. In the third update video, you could see that the key streamers were having a hard time accepting massive changes - again. The only way to fix the controls was to move into a landscape layout and adopt the control model from Tencent’s mega-hit, Arena of Valor. In the new control-scheme player has a contextual d-pad under his left thumb and a two attack buttons on his right side – one for base attack and the other for the ultimate attack. Aiming is done by holding the right thumb on the button, moving it around and releasing to fire. The game also added auto-attack, which allows the player to simply tap on the attack button and the Brawler would attack the closest opponent. On the other hand, Tap to shoot, which was players favorite, was taken away. This was a mistake, since. I believe this control scheme should have been kept as an alternative to ease the community’s transition to the totally new control scheme. B. Brawlers with longer range couldn’t see their targets. After all, the levels and the characters were originally designed for portrait. C. The game started to look even more unpolished and the Brawlers appeared to move slower vertically. D. Brawl Stars game became less strategic as flanking by moving along the sides of the map got much harder to the widened view. E. The controls in landscape mode favor right-handed players whereas the previous control system was same for both. F. The auto-attack helps new players by limiting the skill element. This naturally pisses off the old players. G. Most importantly, it forced players to relearn how to play the game. While changes in meta through the addition of new brawlers, levels or balancing is highly welcomed by any community, complete overhauls almost automatically lead to hailstorms. The progression systems’ second overhaul was to be expected because neither the first or the second gacha system were built to last. 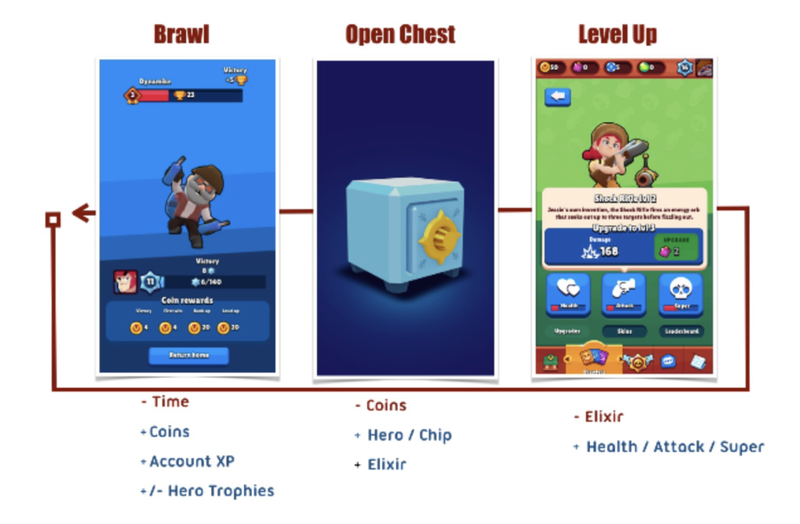 In the third iteration, Brawl Stars' gacha was pivoted and the progression system functions like in Clash Royale. Gone are the Brawler specific pins, badges, and medals, which were introduced just a few months ago. Playing events earns player Keys, which they use to open up brawl boxes. In that sense, Keys have fully replaced Coins. Coins are now earned via gacha together with duplicates of brawlers (again). Both Coins and brawler duplicates are consumed to level up brawlers. This part of the game loop is identical to Clash Royale. Much like before, playing brawls allows players to earn or lose brawler specific trophies. Trophies are used to level up brawlers and matchmaking. The store has experienced the biggest change. It is filled with daily offers and bundles as the game is pushing to increase conversion and purchase size per player. 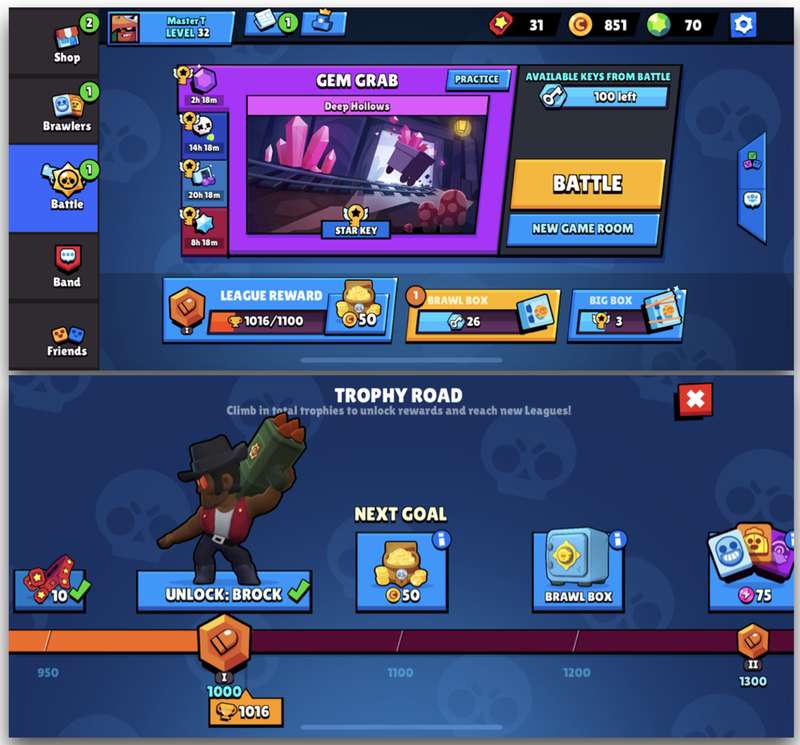 With an updated loop, selling Coins and duplicate brawlers is a sustainable model hampered only by the lack of content. 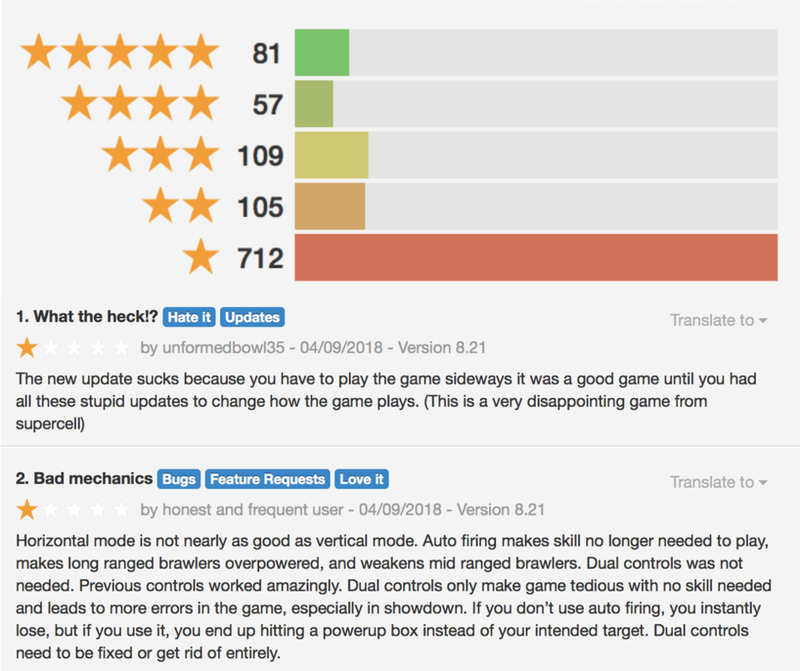 Based on all available metrics, such as grossing ranks, community feedback and, app ratings, the latest version of the game was a disappointment. As it stands, Brawl Stars is a fun game but not nearly enough to take on the ever-increasing demands of the market, which has been invaded by battle royale games since Brawl Stars soft launched. You see, while the team was hard at work solving the control and the metagame, they overlooked the core gameplay, which simply lacks depth compared to its rivals today. In other words, Brawl Stars’ design fits the accessibility and session requirements on 2017 but it doesn’t deliver on the same requirements for today’s mobile players They’re competing against Fortnite and PUBG now. Heist 2.0 mode, where instead of one team attacking and the other defending, both teams have a safe they are trying to defend and destroy the opposing team's safe. With the last update, the amazing UI and UX of Brawl Stars got even better. And the Trophy League system offered much needed reason to grind for the Trophies. But despite delivering a fantastic content filled update, the biggest issue, change from portrait to landscape, still remained. Looking at the reviews and ranking numbers, the change to landscape upset the existing users without bringing the hoped improvements in the long-term retention of the new users. In fact, the latest update has an average of 3.5 Stars in iOS reviews. This is higher than the 3.0 Stars of the previous update but still way below the targets for a global launch. "Our decision was not portrait to landscape. Our decision was landscape or kill. The last update had no streamers and was shot from the Community Manager's desk. No streamers. No studio. Ryan openly said that the game is on its last leg. If this update doesn't deliver, Brawl Stars will be closed. In the end, one key decision effectively killed the game: Auto-aim. Though I don't have specific proof, it is the most likely candidate as to why the game has struggled immensely since it was added. With auto-aim in particular, it goes beyond the fact that it overwhelmingly breaks the competitive balance of the game due to certain characters utilizing auto-aim much more effectively than others. It all comes down to depth, and how the player can feel mastery over that depth. One could argue that there is a significant amount of depth in Brawl Stars. Between the thousands of character interactions, team-based tactics, different maps and varied modes, there is a lot to learn and even after months you are still learning new things. Especially if new game modes and Brawlers were added at a regular cadence. One of the most important elements of mastery is the controls. Being able to effectively control your character is, in many ways, half the battle. And stemming from of its massive impact on the amount of depth in the game, it is also the most obvious source of depth, especially for new players. What auto-aim does, is it takes that source of depth and throws is straight out of the window. A new player who picks up the game runs around and absolutely dominates because they no longer have to aim, which makes the game too easy and too simple to be a competitive eSports title Supercell hoped it to be. Even if they aren't actually winning matches, after just a few games the consistent response from players is "now what?" They feel like they've already mastered the game and are bored of it. A feeling that will not happen to anybody who picks up League of Legends, Fortnite, Clash Royale, or any of the other massively successful titles in the wild. The team behind Brawl Stars should be proud of the incredibly fun hero brawler they’ve built. At its core, Brawl Stars has simplified multiplayer online battle arena, arguably the most demanding game genre, into a pick-up and play version on touchscreen devices. That, ladies and gentlemen, is a phenomenal feat. There’s no doubt that Brawl Stars could be a worldwide hit game if launched. If not a sustained hit then a bright rainbow colored shooting star landing somewhere in the top 100. Whether you want to see it as a simplified League of Legends or top-down Overwatch, Brawl Stars has built a strong community out of the gate and showed it can grow by tapping into influencers and streamers. But the question was never about whether Brawl Stars is a “good game” or not. The question was always if Brawl Stars could become a billion-dollar franchise. Supercell has already four live games and the company’s resources must be stretched thin between running them and having several teams creating new ones. Not to mention the fact that the rise of battle royale games has significantly hurt company’s crown jewel, Clash Royale. Just put yourself in the shoes of one of the Supercell's decision makers: Would you commit a significant portion of your highly limited talent pool to operate a top 50 game? Or would you commit those same resources to developing, marketing and supporting current or future billion-dollar games? Personally, Brawl Stars influenced my design thinking the most in 2017 and I rooted for the game since day one. But it has been soon a year since the game soft-launched and the improvements, while very substantial, haven’t kept me or my friends playing. If I had to take a guess, I’d say that Brawl Stars is the most high-profile game to get cut during soft-launch. Afterall, quality is worth killing for.